I have seen and loved “typical” biopics. You know—that formula that takes us on quite the ride of the life and loves and losses of an individual, spanning decades. The short montage that represents the years passing just so the movie can settle into the new, exciting time period during which “more stuff happens.” I’ve often found those to be cheesy. Why not just cut to the next scene and put the year on the screen? But then there are the biopics that do focus on a specific time in an individual’s life (not decades) but are still “typical” in their formula, often (as the first case is also often accused of) in order to become “Oscar Bait.” Just like with their counterparts of wider scope, the pacing, the dramatic scenes that focus on incidents that tug at the heartstrings of moviegoers, and, of course, the choice to leave out certain incidents that wouldn’t “play into the narrative” that moviegoers have been sold are all elements. When I walked out of Love & Mercy (dir. Bill Pohlad, wri. Oren Moverman and Michael Alan Lerner), based on the life of Beach Boy Brian Wilson, my first thought, after I’d just seen (and liked, actually) a biopic that was, in fact, formulaic, my first thought was that this was not your typical biopic and is worth watching for that and for the pacing, the performances, the incidents, and all of those choices made, but because they are not formulaic or what you’d normally see. 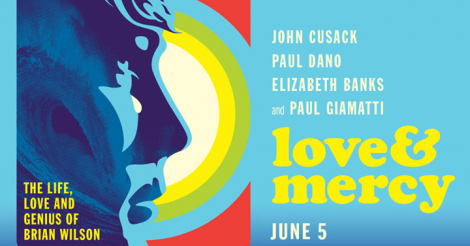 LOVE AND MERCY – 2015 FILM STILL – Pictured: Paul Giamatti, John Cusack and Elizabeth Banks – Photo Credit: Francois Duhamel Roadside Attractions Release. There is a montage, but it is so well done that I, in the best possible way, did not know what had hit me. I will not reveal the way it is put together, but it takes place at such a height of emotion and showcases how excellently Paul Dano and John Cusack share the role of Wilson. The way the film treats time is one of its main strengths. Dano displays his talents as his character is caught in the conflict between commercial success and true artistic fulfillment, which, as it mostly always does, involves pressure from others to favor the former. Cusack shows us the toll years of unbearable pressure, work, and mental illness can take when there is no help available and there are people around taking advantage of you. Paul Giamatti (Dr. Eugene Landy) is terrifying as one of those people (and he does it so so well—he can do anything). In my book, the standout performance comes from Elizabeth Banks, who plays Melinda Ledbetter, who meets John Cusack in a car dealership. She is a character in her own right and has a life and a history. Banks very impressively carries all of that and brings weight to the role as a woman who is adding to her life unpredictably bizarre situations and manages to achieve what no one else is ever able to achieve.